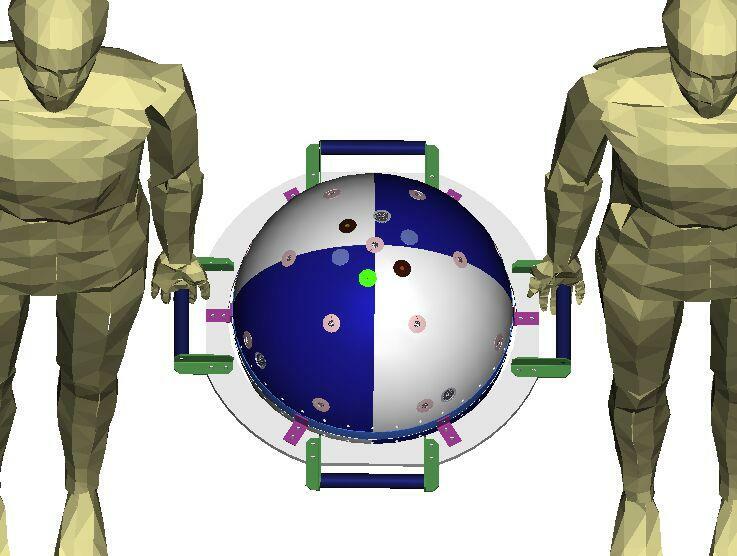 See the Documentation Page for details on the spacecraft design. STATUS: The Flight unit is at KSC awaiting launch on STS-116 planned for the first week of Dec 2006. It was delivered to the Cape the week of 11 July for integration starting on the 17th. 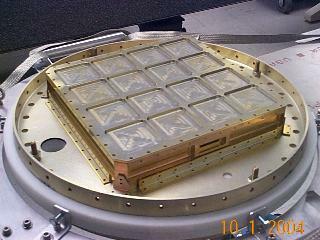 The USNA comm systems for ANDE were complete and integrated in the spacecraft and tested as of 15 August 2005. This is after a significant set-back 27 May 05, when the finished Comms modules as pictured above were burned to a crisp the night before delivery by a failed 60C heat-chamber thermostat. See photo. On 29 May we began ordering parts and completely re-built it and delivered the second complete system by 13 July 05. 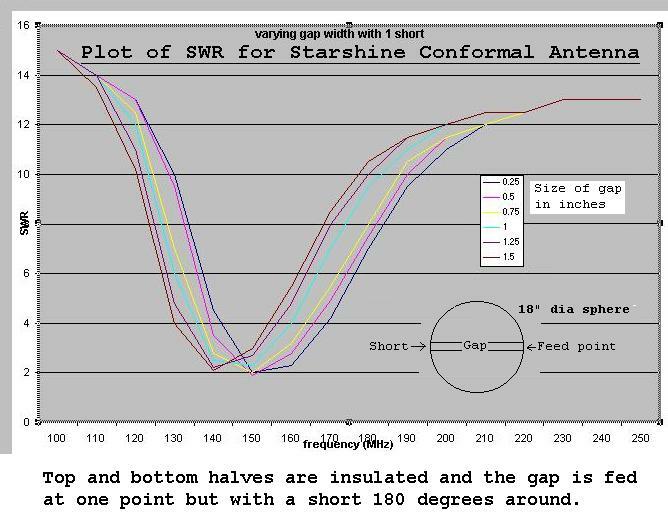 As shown below, the final tuning of the spacecraft as an antenna occured on 15 Aug 05 and got an amazingly good 1.2:1 SWR! COMMUNICATIONS DESIGN DETAILS: This web page addresses only the communications portion of the design which is our responsibility. We maintain this web page daily as the design and development proceeds. 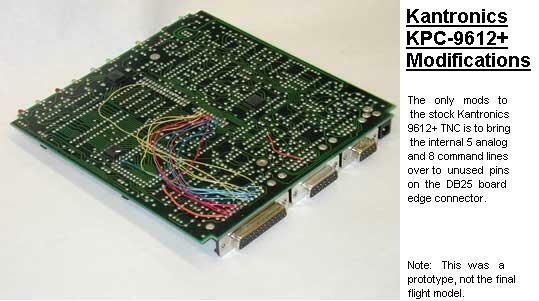 The communications, telemetry, command and control is all based on the off-the-shelf Kantronics KPC-3 TNC as shown below. 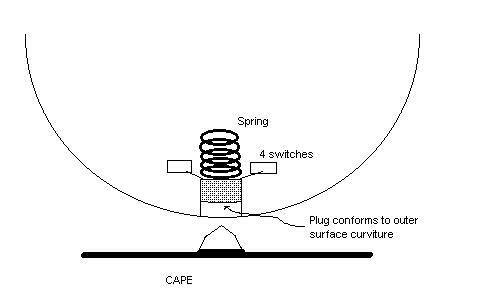 What makes this design unique is the absence of any external antennas as required by the minimum drag needs of the science experiment. 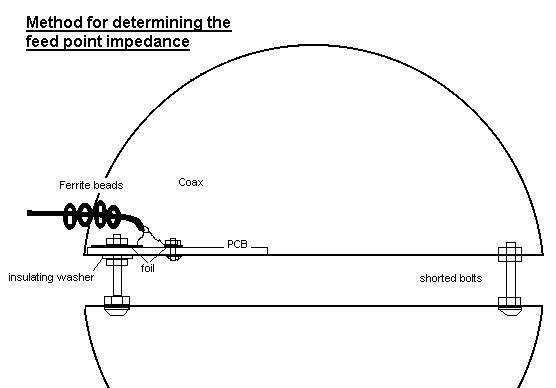 We solved this by cutting the sphere in half so that we can use it as a dipole antenna across the two halves. Lithium Primary Battery Power System: Another unique requirement of the comm system was to operate for up to 1.5 years on primary batteries without any solar cells or external charging. 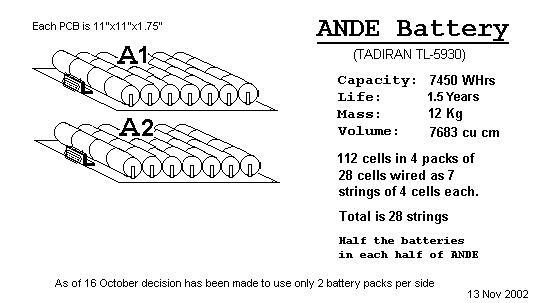 Thus, ANDE runs on 112 "D" cell Lithium thionylchloride cells arranged in 4 packs of 7 strings of 4 cells in series. To meet the man safety requirements for launch on the shuttle, extensive testing has been conducted. 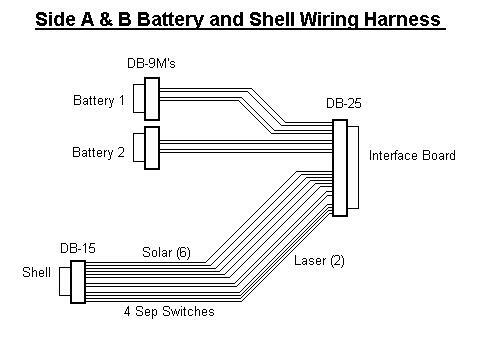 Battery Box: Cell Arrangement, Schematic. 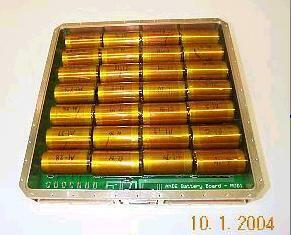 Battery Life Management uses 3 battery packs separately to exhaustion for lasers to yield measurable life data. Present design yields 1.5 year Power Budget using the Tadrian TL-5930 Cell. 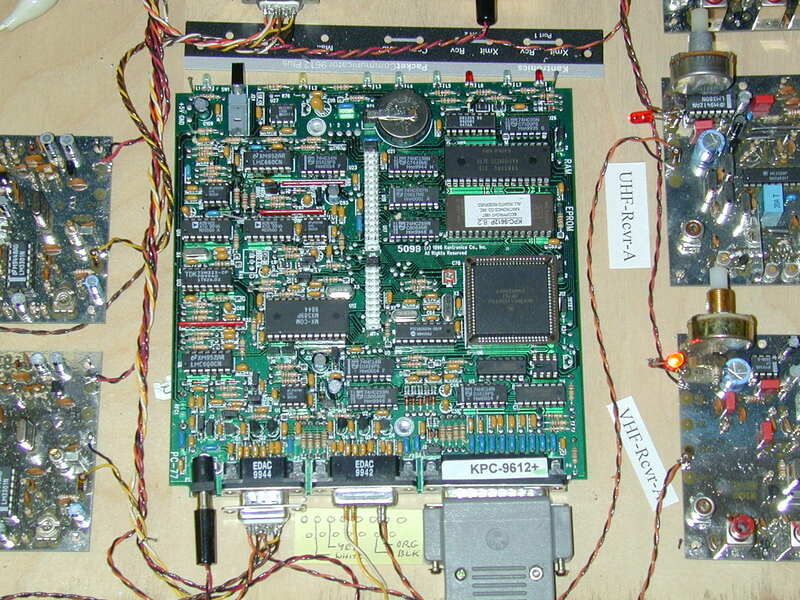 The communications system consists of a Kantronics KPC-3+ TNC, a Hamtronics transmitter and receiver and a custom interface board to hook it all together. These are all mounted in a 1" tall box on top of the battery boxes. Communications Tray Layout, Interface Board PCB Design, and Parts Locations. Using the KPC-3+ for Teemetry TNC Mods. TelemetrySensors, Schematic, and Conditioning Circuits. Text-to-Speech Schematic.... with the supportingText description and a link to the MFR's documentation. 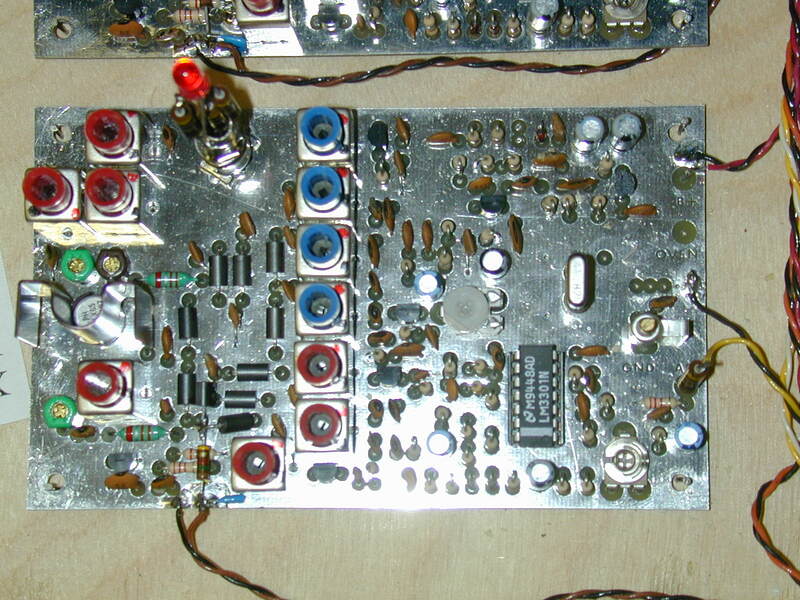 VHF receiver (photo) (pots are removed for flight model). Click here to download EXPRESSPCB.pcb file. Use the free ExpressPCB software to view it. 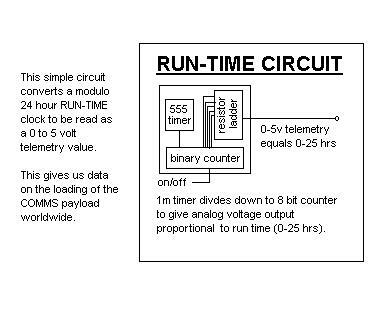 Telemetry Multiplexer , RunTime Counter, and Interface Board changes required . Telemetry format and equations . 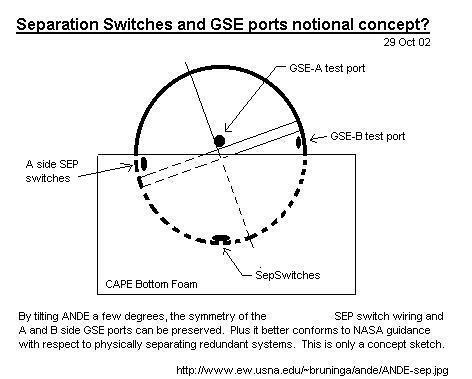 GSE Test Equipment and Test Plan. 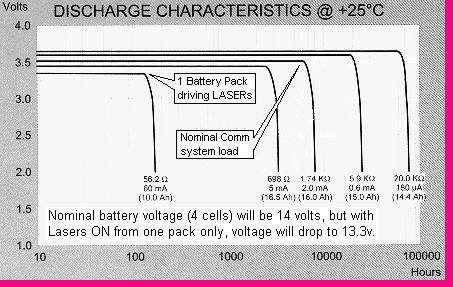 MULTI-PACK BATTTERY DESIGN: Since the lithium discharge profile is totally flat to 97% of battery life, the only energy usage data will be obtained by using each pf the 4 battery packs to exhaustion to run the LASERs. This will give 4 energy benchmarks during the mission. Also, by using the LASER-ON switch to toggle the telemetry channels, we gained 4 more telemetry channels. 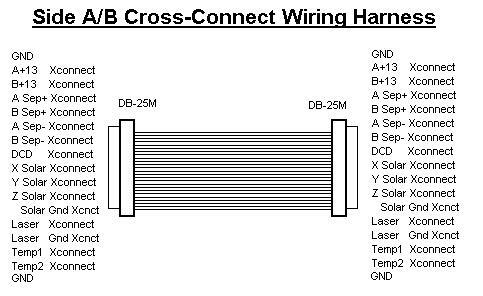 Just prior to CDR the requirement for additional temperature data has extended the multiplexer to a total of 16 channels. 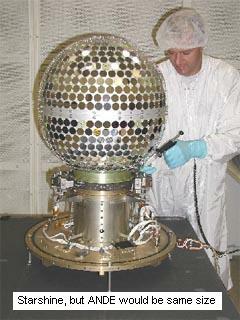 The photo below is NOT ANDE, but it does give a representative view of a 19" spherical Spacecraft. 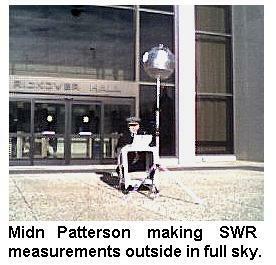 In the spring semester 2002, Midn Patterson (EE Dept) in conjunction with the USNA Small Satellite program under the guidance of LTCL Billy Smith and Satellite Lab Engineer, Bob Bruninga, WB4APR did initial investigations into conformal antennas for such low-drag spherical spacecraft. 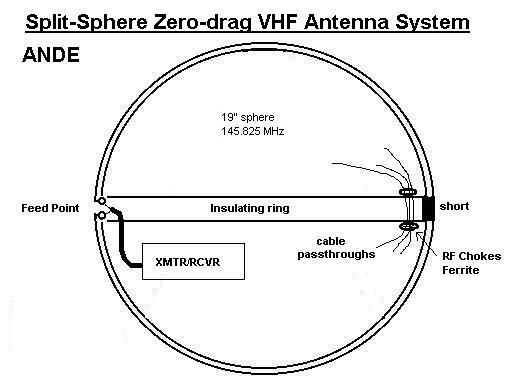 These showed that the natural resonance of the 17" sphere was near to the amateur satellite band on 146 MHz and if this frequency was used, that the sphere could be used as the antenna itself with no external protrusions. 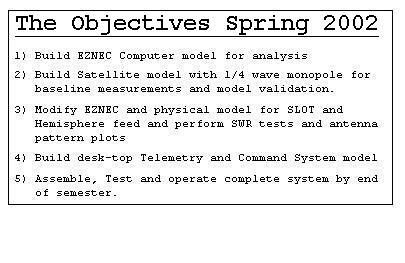 The FIRST SEMESTER objectives below were accomplished in the Spring of 2002. 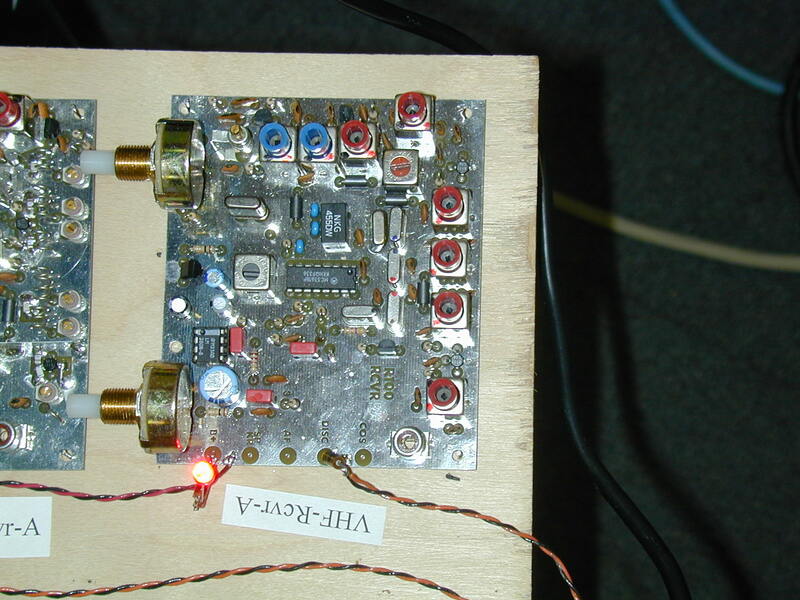 A text-to-speech experiment for downlink communications to mobile and handheld users without digital packet capability. The digital communications relay will operate within the ITU regulations for operations in the Amateur Satellite Service, to provide digital communications for amateur satellite operators, educators and possible remote environmental sensors worldwide. This mission will augment the communications mission of PCsat by adding a second and third satellite to the constellation for comms support of remote travelers Naval Academy Boats at sea, cross country travelers, expeditions, or any other travelers far from any existing APRS terrestrial communications infrastructure. The PCsat and ANDE downlink from such users is fed into the existing worldwide internet linked APRS system by a few permanent ground stations. ANDE would join ISS, MIR, PCsat and several other on-orbit experiments (ASTARS) that have been conducted over the years leading up to this exciting capability. 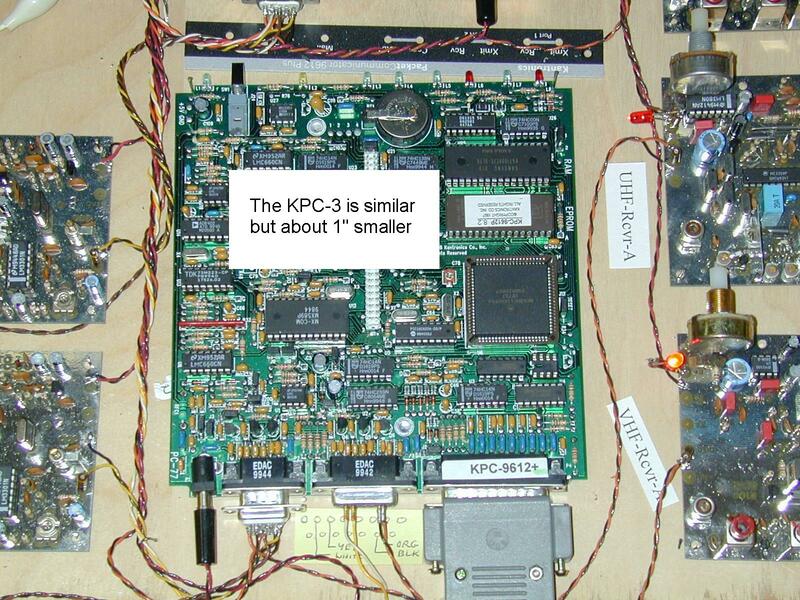 The TNC COMM SYSTEM (this is the KPC-9612. The KPC-3 is slightly smaller). APRS is the Automatic Packet Reporting System that the Naval Academy uses for tracking its boats and a variety of other vehicles and networks using the APRS Automatic Packet Reporting System . 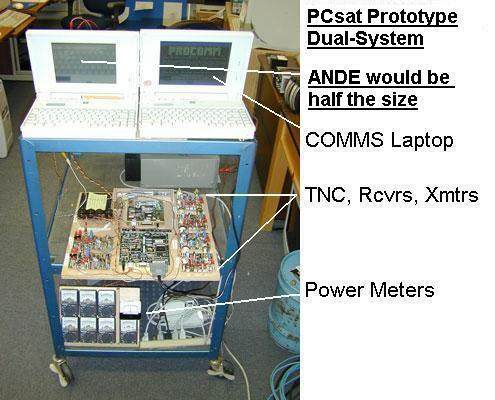 The ANDE Communications transponder would be operated under the rules of the Amateur Satellite Service and the rules of the FCC. 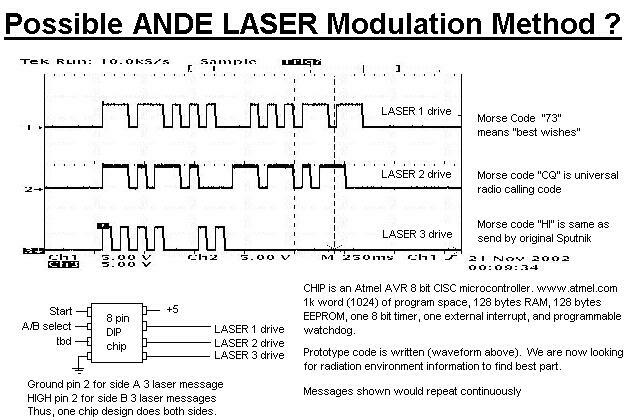 Suggested Morse Code sequence for Lasers. Original A/B Battery/Shell Harness and A/B Cross Connect harness. 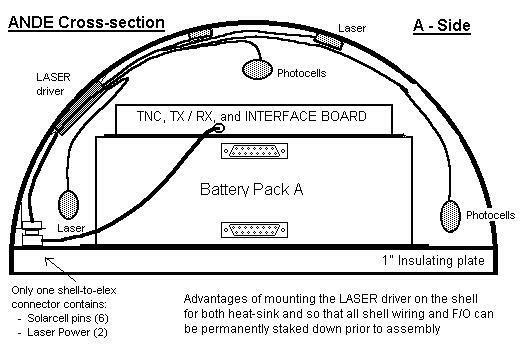 Look at this idea for mounting the Laser Driver on the shell. 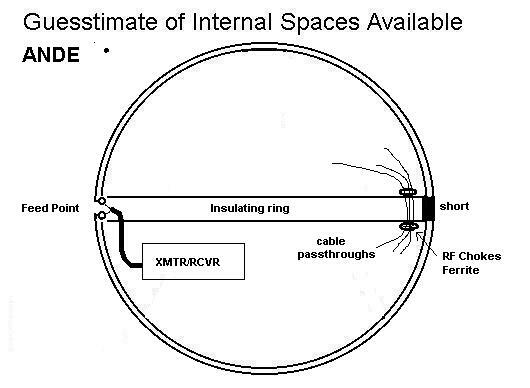 A commercial wideband spherical antenna design. Probably not applicable to our needs.